The Trust is a Charity, registered in Scotland. It owns Hume Castle which is open to the public free of charge. The Trust is associated with the Clan Home Association, which seeks to maintain links with other Clan Home and Scottish societies around the world. 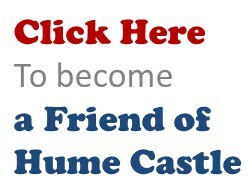 Click the Donate button to subscribe as a “Friend of Hume Castle” and enter an amount of at least £100 in the “Donation amount” box on the PayPal screen. You may alternatively donate a lower amount and not become a Friend, or you may donate any higher amount which will be very gratefully received. If you are a UK taxpayer, we can get an additional 25% of your donation if you download and complete the Charity Gift Aid Declaration form. Once completed, please email it to the Treasurer. Following the very successful rideout, I’ve uploaded a number of photos taken by Hume resident and Hume Castle Preservation Trustee, John Nicholl. Have a look by hovering over the Gallery and clicking on the collection.